A large, full mature strawberry tree. Photo courtesy of Brandt Maxwell. 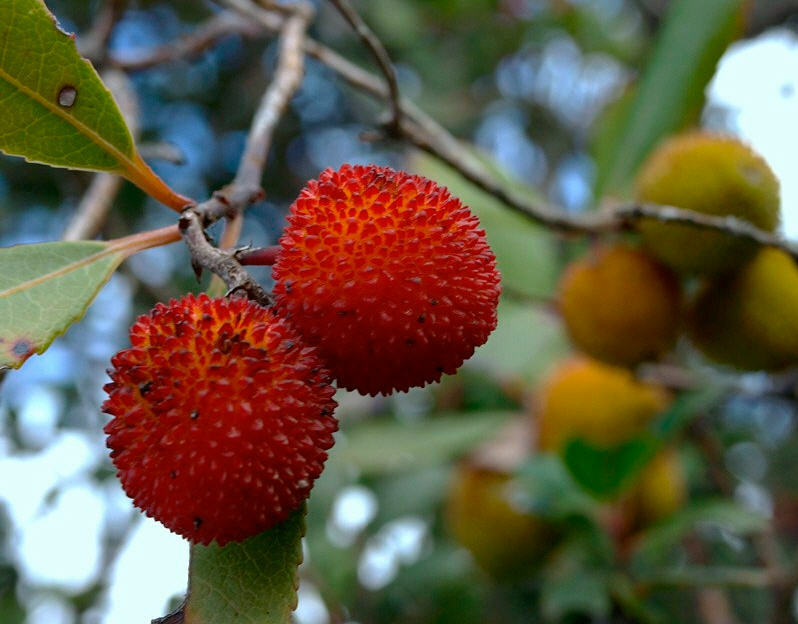 Arbutus unedo, commonly known as the strawberry tree, is a medium sized evergreen (typically 3 to 6 feet tall with varieties that reach 8 to 12 feet) that is native here in Western Europe. It thrives on the sandy coastal soils around the basin de Arcachon in the west of France where it grows among the pines and oaks that are also tough enough to cope with the sandy, windswept conditions. Right now, the trees are covered in their orange-y, red fruit that looks something like a cross between a strawberry and a litchi. They have little taste but it would be unpatriotic for any true Frenchman to leave such a juicy looking fruit alone unless it were definitely toxic, so here is frequently distilled into an Eaux de vie (water of life) brandy. This is a distillation process that takes place over much of Western Europe and in Portugal where the drink is known as medronho although it is much the same product. The tree appears on the coat of arms of the city of Madrid and they have even built a statue of a bear eating the berries of one of these trees. The fruit ferment on the tree and, according to Spanish folklore, bears can become drunk by over-consumption. As a gardener, I find this a very useful tree to plant. Being evergreen that is not too big, it is ideal for smaller gardens and the fruit appear at just that time when most other trees are losing there leaves and becoming a little boring to look at. An added benefit is its small white, bell shaped flowers take a year to develop so they appear at the same time that it bears fruit. Fruit of the strawberry tree. Photo courtesy of Ellinas N.
Now at risk of being bitten by my dog, hit over the head by my wife or lynched by one of the more vociferous tree lovers out there, common cowardice dictates that I should point out one or two facts in connection with this proverb. First, the theory goes that if you slap the tree a few times with a lawn rake then it will increase the pollen fall and thus the fruit production. Secondly, I am only quoting the proverb and it did not originate from my own, more timid, life-preserving thought processes. Left to its own devices, the strawberry tree can turn into a rather untidy shrub with little real architectural value. It is very tolerant of pruning and this can dramatically change the tree’s form. I prefer to keep four or five stems exposed to a height of around four feet. The peeling bark is attractive and this gives the tree more of an open effect that is much more pleasing to look at. Others prune the tree to a standard that gives it a formal feel. It should be noted that this tree is highly intolerant of root disturbance. So, chances of moving anything bigger than a large seedling are slim, but there are cultivars such as A. ‘Marina’ which are equally attractive and much more forgiving. 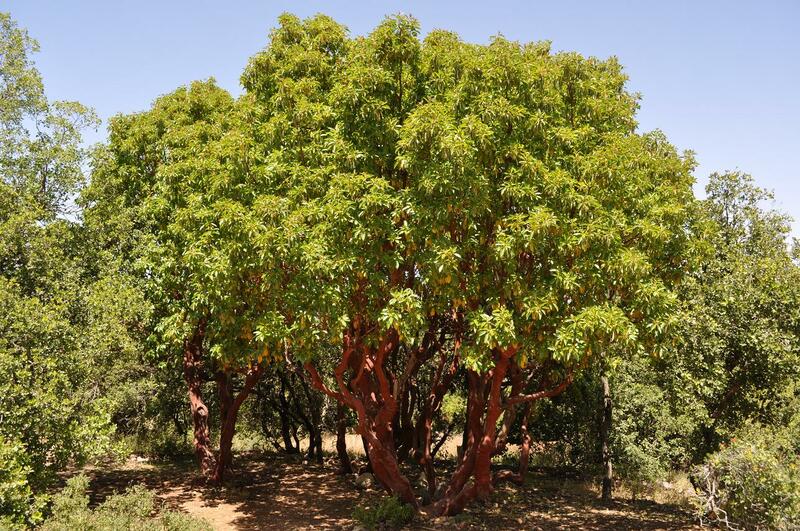 This entry was posted in Fruit, Trees, Uncategorized and tagged arbutus unedo, France, French, French garden, fruit, frut trees, garden, gardening, Mike Alexander, strawberry tree. Bookmark the permalink. Are you talking about Myrica rubra, also called yangmei? No, the Myrica rubra is a related fruit-bearing shrub that is native to East Asia.